The origins of the Plaza, bullring, probably are not the Roman amphitheaters but the Celt-Iberian temples where those ceremonies were held. In the province of Soria, close to Numancia, one of them is conserved and it is supposed that there bulls were sacrificed to the Gods. While the religious cultus to the bull goes back to Iberians, it were the Greek and Roman influences that converted it into a spectacle. During the middle-ages it was a diversion for the aristocracy to torear on horse's back. That was called suerte de cañas. In 18th century this tradition was more or less abandoned and the poorer population invented the bullfight by foot. Francisco Romero was a key-figure in laying the rules for that new sport. 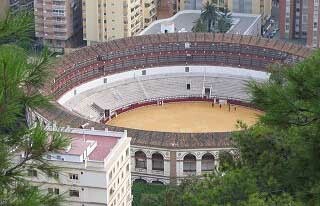 A Corrida starts with the paseillo, with everybody involved in the bullfight entering the ring and presenting themselves to the public. Two Alguacilillos, on horse's back, direct themselves to the presidency and symbolically ask for the keys to the "puerta de los toriles". Behind that door there are the bulls. With the door being opened and the first bull entering the ring the spectacle starts. It consists of three parts, called tercios, being separated by horn-signals. There are three toreros in each Corrida, by the way, and each will have to torear two bulls. In the first tercio the bullfighter uses the capote, a quite large rag of purple and yellow color. Now enter two picadores, on horse's back and armed with a sort of lance. The second part is la suerte de banderillas. Three banderilleros have to stick a pair of banderillas into the attacking bull's back. In the final "suerte suprema" the bullfighter uses the muleta, a small red rag. He has to show his faena, his masterity to dominate the bull, and to establish an artistical symbiosis between man and beast. The Corrida ends with the torero killing the bull by his sword.